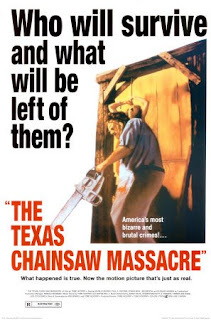 Stay Right Here a Little While...: TOBE HOOPER'S "THE TEXAS CHAINSAW MASSACRE"
Tobe Hooper's "Texas Chainsaw Massacre" (1974) is a landmark film in the world of horror. There is a reason why this movie has spawned so many sequels and one remake. It is hard for a movie to come even close to this film's intensity. Filmed at a frantic, nerve wracking, nightmarish pace with bizarre camera angles and creepy sound effects laced throughout, this movie hits you hard every time. It is about a group of teenagers who make a pit stop for gas and what have you in the middle of nowhere in a creepy, small, hillbilly town. A violent hitchiker, old country music played in the background and blank creepy stares are all you are greeted with from the locals. Of course they wind up sticking around a while and snooping where they shouldn't be, and all hell breaks loose. And this is where the fun begins. All of the sets in this movie convey an unsettling sense of desolation and decrepitude. The suspense and tension that buids with shock after shock as we watch these teens brutally murdered one by one is superb. They only had about 10 days to film this movie and it shows in the atmosphere. Working long days with little or no sleep keeps the tone of this movie on edge and delirious...the intensity of this movie never lets up, and by the end you are emotionally drained. If you are wary of watching this movie because of all the sequels it spawned, don't be. This the one you need to watch. It is one of the best 1970's horror movies ever made, and one of the horror movie genre's greatest movies of all time. Go rent or buy this one now if you haven't seen it already. And if you have...well, watch it again.